That's marching POWER not powder. When I say the word Colombia what springs to your mind? No doubt, instantly an image of cocaine, kidnappings and guerilla warfare. At least ,this is what the Australian Government website would have you believe. Listed on the Australian Department of Foreign Affairs and Trade (DFAT) , a Smart Traveller section that provides updated information for Australian globetrotters, Colombia is labelled a high risk destination, with certain cities dubbed 'reconsider your need to travel', and others listed as simply 'do not travel'. Why then, have I lived in Colombia, in the capital city of Bogota for the last two months and felt none of these effects? Instead of facing turmoil and terror on the streets, I spend my days wandering the city, the same size more or less as Sydney, discovering new restaurants, shopping malls, student hangouts, cinemas, bars and parks. I live in a hip, Bohemian neighbourhood with my partner Javier, filled with stylish restaurants offering various cuisines from around the world, furnished with classic old fashioned furniture or with retro to modern design, depending on the individual ambience of the place. 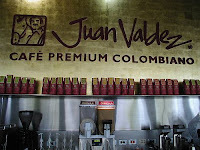 I often accompany Javier to his University, located in the centre of the city and part of the historic La Candelaria, which during any given day of the week is filled with students, wearing fashions that could put the best dressed Australia to shame, drinking beer and famous Colombian coffee in the colourful cafes and open air bars that line the surrounding streets. On weekends, I like to go to one of the many parks that are contained within Bogota. The biggest park, Simon Bolivar, spans about 4 square kilometres, has an abundance of green grass and a lake in the centre, with paddle boats and kayaks to hire for children. Due to their Catholic background, Sunday has remained a day Colombians devote to the family, and any given Sunday, Parque Simon Bolivar is filled with parents, children and friends having picnics, playing soccer, throwing a Frisbee, listening to music and if you look into the air, you would see no less than 200 kites flying high in the sky. Alternatively, the best way to get a look at the landscape Bogota has to offer, is to walk up one of the surrounding hills. At 2600m above sea level, Bogota is built on a plane, however the East of the city is lined by green hills, which contain a number of small villages only 40 minutes away, perfect for a weekend day trip, to get out into the countryside and eat the local bakery food, or sample Canelazo, hot brandy with cinnamon, from a quaint roadside bar. 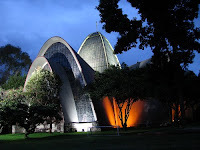 Monserrate is the best known mountain in Bogota and the centre of the city lies at its base. It takes about an hour to walk slowly up the winding trail, or for $4,you can take the glass Gondola to the viewpoint and walk around, while sampling the traditional hot bread, Pandebono and Avena, the local drink of chilled oatmeal from one of the many food stalls at the top. On a clear day you can see all of Bogota, the historic Plaza be Bolivar where the Constitutional Court and the Parliament stand, the green section of the Parque Simon Bolivar in the distance and the eclectic mix of business metropolises and residential neighbourhoods that flow from the South to North and from the base of the East mountains far into the West. A city of 8 million people, the transport is highly organized and exceeds expectations. 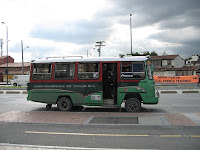 Since Bogota was not designed with a Subway, in the last decade an initiative was to create a separate motorway for a bus service called the Transmilenio, something similar to a subway above ground. These red buses travel all over the city to the far reaching neighbourhoods in every direction and have clearly marked routes as you would find in a subway map. , which runs directly through the city from South to North has several buses passing every minute going to practically every destination of your choice. The buses are privately owned, and although the licenses and routes are regulated, this means that without bus stops and timetables, it is impossible to miss a bus, because generally there is another one coming along seconds later. At any time of day you can hail a taxi. They are all licensed, clearly marked yellow Hyundais, which contain the name and photo of the driver along with a laminated price table for fares to all areas, to avoid any potential scams and corruption. However, it is unlikely you would be so unlucky, most cab drivers are Husbands and Fathers, or sometimes University students trying to earn some extra money in their spare time. 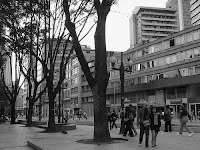 And although trees and mountains are aplenty in Bogota, the air is sometimes congested, as often happens in a city with many buildings and transport. However, Colombia is also miles ahead of many Western cultures in how it maintains the environment. While the world watches proudly as China regulates transport during the Olympic Games, the major cities of Bogota have had a pollution system in place for several years, which has designates, using the final digit of a car number plate, which days a car is permitted to travel within the city during peak hours. If it's not your day, it's public transport, otherwise face a hefty fine. Although the people of Bogota are not as well travelled as the Western world, this is certainly not due to lack of interest. Javier's friends are all studying difficult degrees such as Engineering, Law and Marketing while working hard to get ahead in their chosen professions. However, while Colombia opens its borders to citizens of most other countries without requiring an entry visa, the people of Colombia are subjected to severe travel restrictions in every country of the world. The years of Pablo Escobar did endless damage to the reputation of Colombians and they must be pre-approved for Tourist Visas for Australia, New Zealand, European and North American countries – a time consuming process and expensive process which they can barely afford in addition to flights, simply to enter a foreign destination. Javier, who was returning from India to Colombia, had to pay $150 for an Airport Transport Visa, which simply entitled him to spend 1 hr in Charles De Gualle Airport in Paris, as he waited for his connecting to flight to Bogota. I wouldn't have believed it myself, except I went to the visa office and waited patiently to pay and obtain the permission, which was granted 3 days later. This is of course to avoid the select few Colombians who may manage to raise enough money and be approved Visas to France, fly their family to Paris and then stand in the airport and claim refugee status, thus causing the Government problems they would rather not have. For this, France sanctions a whole country. In addition to this, Javier, two years ago, applied for a Visa to travel to New York to visit his girlfriend at the time, who was working there. He had the flights reserved , proof he was half way through his 5 year Electrical Engineering degree in the best University of Colombia, proof his Father, a respected Magistrate could support him with any funds and finally proof he had a full-time job with a reputable software firm. His application was rejected for no reason, other than simply, they told him, he did not provide enough proof he would actually return to Colombia and not stay in the United States trying to obtain illegal work. It is hard to wear the nationality of a Colombian sometimes. I have seen the look on Javier's face, when foreigners in India asked where he was from. He would answer Colombia, and I would brace myself for the standard……'Are you a Narcotrafficer? So can you get me some Cocaine…. or any other crack, excuse the pun, along those lines. I hope when he comes to Australia, people are informed enough to say something like 'Ah Colombia – great coffee, wonderful fruit, great biodiversity in your beautiful landscape or even hey, Shakira's music isn't that bad.' But I am fearful I'll be forced to watch on again, as Australians make Cocaine connotations and fail to back up the joke with something that comes off more knowledgeable. I have to say, it's nice to say I'm Australian and the worst association I get, usually from Americans, is an imitation of a kangaroo hopping or the word "Fosters". We all know how inaccurate those perceptions are of day to day Australian life, so please when you think of Colombia, don't follow the media representation and imagine that Colombia is a reflection of what the select few do wrong. Sure, there is a still a big difference between rich and poor, but the government is slowly combating this, and some reforms do exist to help the poor with medical treatment and education for their children. In fact the situation in Colombia is far better than in Thailand or Indonesia, where thousands of Australians happily plan their holidays each year. In addition when the DFAT website simply states DO NOT TRAVEL to several Colombian destinations, it fails to point out Colombia is a rather large country and suggesting not to travel to certain places due to danger of terrorism is like suggesting not to travel to Melbourne when there is civil unrest in Alice Springs. Also, while a flight between Colombian cities may take 1 or 2 hours, the travel overland is impeded by mountains, so a surprise terrorist attack is unlikely given that 800km can take between 16- 22 hrs by car. They certainly don't have missiles here and most of the Guerilla activity is rampant in the jungle area ,where simple common sense implies you don't wander into the Amazonia, as a foreigner, alone without an official guide and only a backpack. The same applies to the likelihood you'll find yourself in the middle of a drug cartel; stay out of their way and generally they will probably stay out of yours. In many ways, the streets of New York and even those within the darker sides of Sydney and Melbourne where heroin and Ecstasy can easily be found are just as dangerous as the threat of exposure to the underworld in Colombia. I'm not sure about you, but I don't often venture into those alleys for fun, and if I did, I'd probably be just as likely to come face to face with violent crime as I would if I went down the dark streets you can also find in the places I mentioned above. Bag snatching still exists day to day, in fact I saw the first one happen after two months in Colombia right in front of me today, some kids taking a bag from a young girl, but that is not a reason to avoid travel to a country altogether. I'd like to sum up by taking a look at the demographic and psyche of the people in Colombia. Whether rich or poor, most are proud individuals working hard to help their family get ahead, in a country which has felt the price of worldwide inflation with global imports but at the same has an economy that cannot yet support a high relative wage to keep up. Despite its imfamy in drug exporting, drug use, amongst the population is considerably low, and mainly fuelled by the poor who with few other options fall into bad circles trying to make money the wrong way. Children are aware how hard their parents have to work, to help them through their University, which can cost up to $5000 a semester, if it is private (public Universities exist, but the third world economy, along with a high demand of young students means private facilities offer a better level of education and places within public Universities are limited). Further, it is not feasible that a student takes a part-time job to support their own studies because the average wage for such employment is about $3 an hour. ), that runs through the city. It's called Cyclovia, and it's for cyclists, rollerbladers and pedestrians to use the 8 km stretch through Bogota, free from the danger of automobiles. 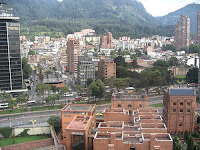 Bogota is an organized city, as are the other commercial centres of Medillin, Cali, Cartagena and Manizales - all have the same address system of New York, with streets numbered in ascending order from South to North, East to West, meaning that navigation for citizens and tourist alike is straight-forward. 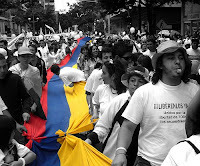 Colombia is a power marching forward, it may not be there yet, it still has its economic and some internal problems, but I am sure, in the next ten years, the people of Colombia and the rest of South America will emerge as prominent contributors to this century. A strong focus on technology, infrastructure and the mindset of our generation are helping Colombia to become a safe and modern country. And when considering a future holiday, I beg you to look a little deeper than what you may see in the news or read on a poorly updated Australian Government website. Because while we are happy to go to most Asian destinations for the service, value and beauty they offer, I can assure you Colombia and South America have a landscape comparable to none, brilliant cuisine at prices you used to find in Australia 15 years ago. But above all there is exists within Colombia a friendly population of young and old alike. Unlike the Asian culture which still predominantly sees Westerners as customers and not necessarily friends and acquaintances, sit on any bus, go to any pub or meet any young student in the street, and it's most likely they'll invite you for a beer, talk about their culture and appear no different than any other person our age or from Europe or America, after all they are from Anglo-Spanish origin and our cultural values are predominantly the same. Ironically, the biggest danger you may face in Colombia is the impediment to their generosity, kindness and friendliness, fuelled by the Western perception that Colombians are untrustworthy, dangerous and uneducated.